Launched in 2011, the Global Ph.D. Fellowship recognizes and supports outstanding graduate students who are pursuing research-based master’s and doctoral degrees in science. 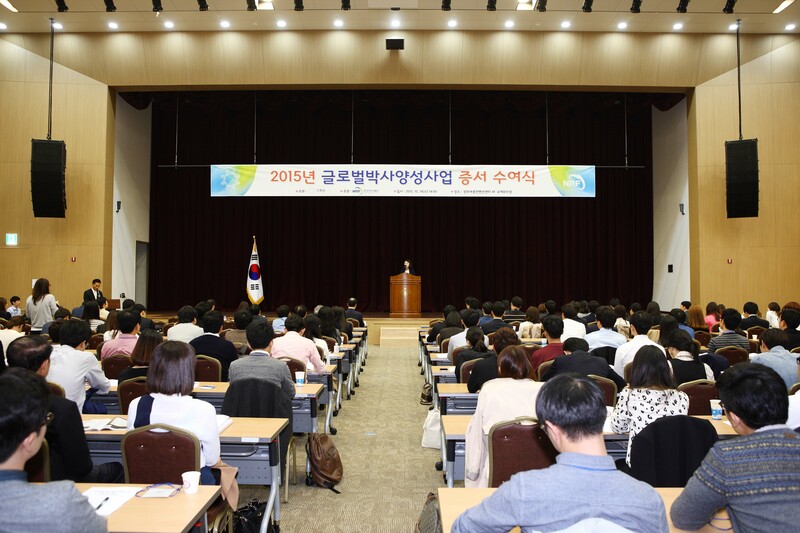 It is a competitive nationwide education program provided by the National Research Foundation of Korea. The primary purpose of this program is to nurture world-class academics and researchers in Korea with the capability to compete at the highest level. 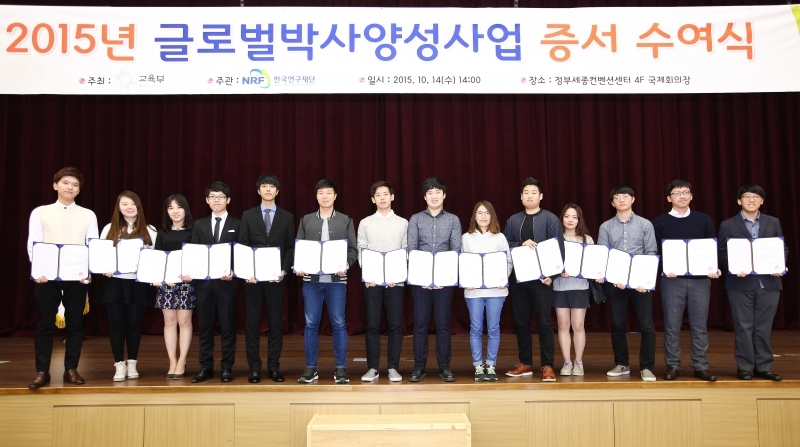 The program selects those who demonstrate high research capabilities and provides two years of intensive support, including a total of 60 million KRW (2.5 million KRW per each month) scholarship funding. Among those recipients, students who are in a combined M.S./Ph.D program will have a chance to extend the support by two years, based on another comprehensive evaluation of achievements and published papers. Doctoral students will likely have the opportunity to extend their funding for an additional three years. This allows them to focus on their study and research without financial concerns. For the 2015 academic year, a total of 21 UNIST students were selected to receive the GPF scholarships. 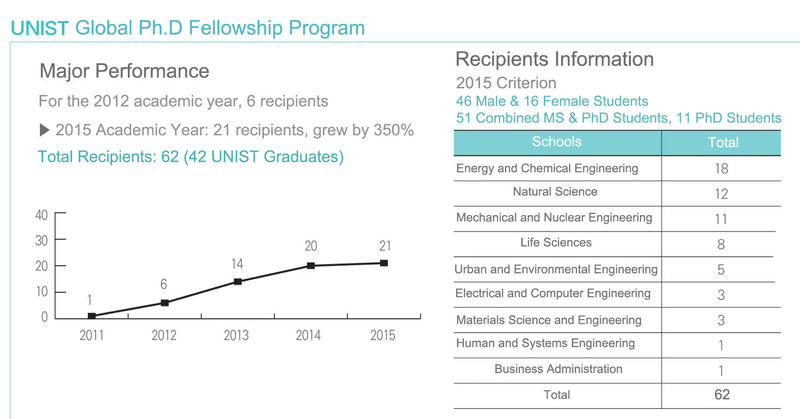 According to statistics, the accumulated numbers of Global Ph.D. Fellowship recipients at UNIST reached 62 in 2015. The results show that this is the fifth largest number, following Seoul National University, KAIST, POSTECH, and Sungkyunkwan University. The Report on Beneficiaries of UNIST GPF Scholarship (As of 2015). 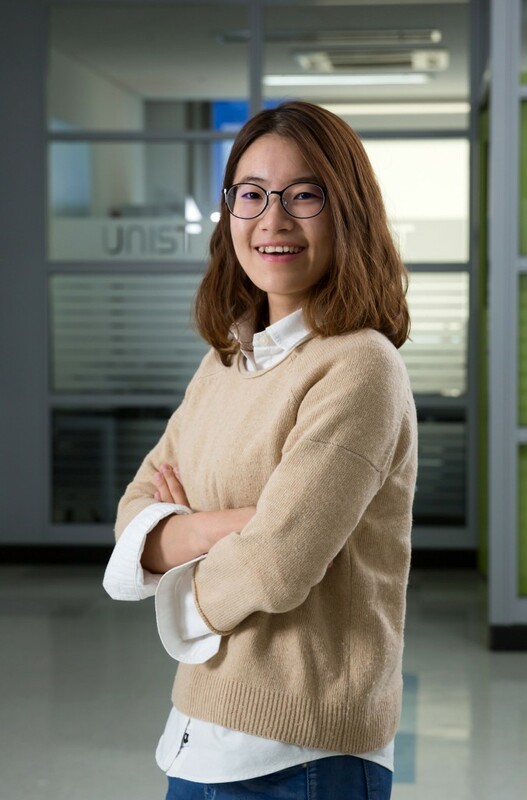 Interview with Hee-In Yoon (School of Electrical and Computer Engineering), a student pursuing a combined M.S./Ph.D. 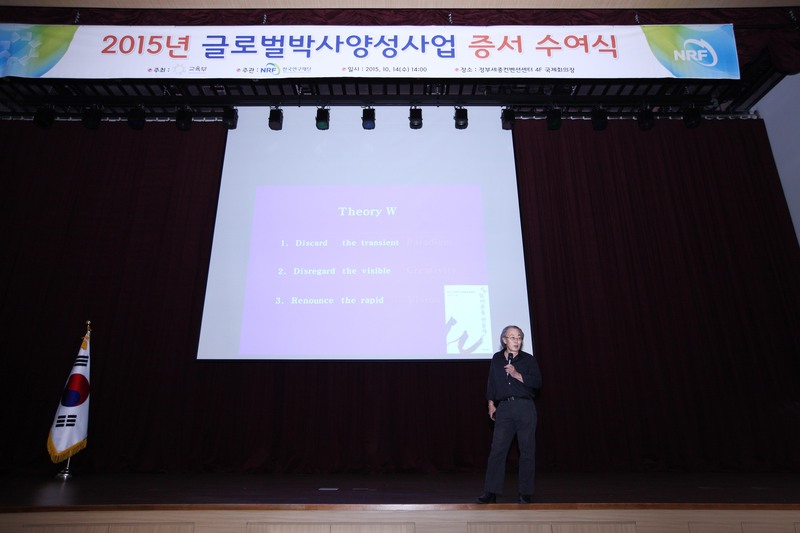 degree at UNIST under supervision of Professor Jaehyouk Choi. Q. What is your major area of research? A. Enterprises around the world, nowadays, are nonetheless deeply involved in 5G-related research and it is now anticipated that 5G will be commercially available around 2020 at the earliest. My major area of research involves semiconductor circuits, associated with 5G. The commercialization of 5G will open a new ICT world, IoT World, and network society. Soon, people can check one’s physical condition and make predictions of major natural disasters. Q. What made you decide to return to school for a combined M.S./Ph.D degree in current field of work? A. UNIST not only offers interesting research opportunities for undergraduate students, but also the chance to work on cutting-edge research. Among many valuable learning experiences, working under Prof. Jaehyouk Choi was the most valuable to me during my time as an undergraduate at UNIST. 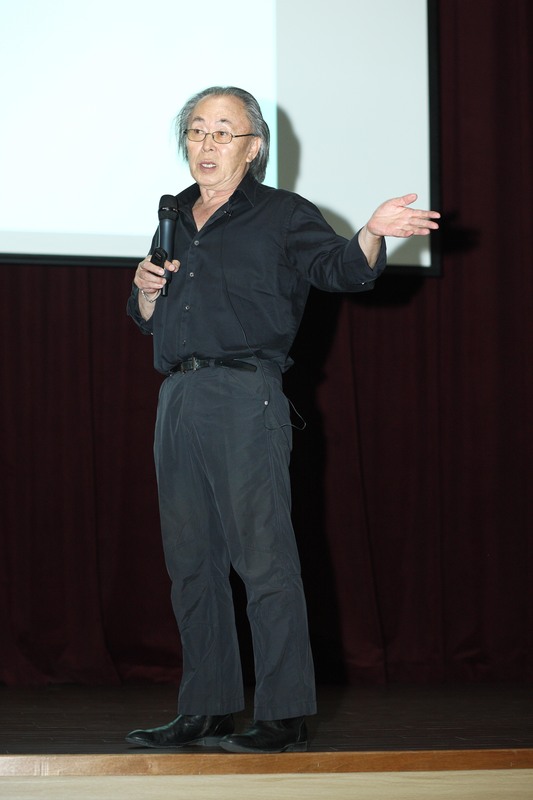 Through those experiences, I have learned the art of a conducting a good and fruitful research project. Q. Any thoughts on receiving this scholarship? A. 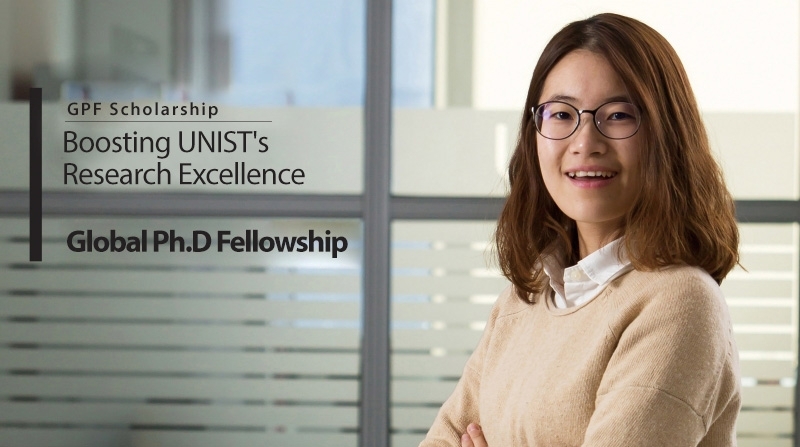 It really is an honor to be one of the awardees, as GPF is the biggest and most competitive fellowship for graduate students in Korea. Q. What are your dreams for the near future? A. If I have a chance, I’d love to work for Qualcomm Inc. or Intel Corp., world-leading semiconductor chipmakers, connecting the world as one by setting up a communications system.